It's the old house of our family! The apartment in question is located on the first floor of a traditional farmhouse. It consists of two double bedrooms, living room with sofa bed, fireplace, kitchenette and two bathrooms (one of these service, without a shower). To reach it there is the external staircase. Air conditioning in bedrooms and living room. WiFi and parking are free. The structure has been recently renovated preserving the original characteristic features. With stone walls with large exposed sections, terracotta ceilings with chestnut beams, Tuscan terracotta floors, antique doors with bolts and old locks, the house is reborn without losing its essence. A corner of authentic Tuscany in the heart of the Chiana Valley. From the village of Fratticciola it is easy to reach the town of Cortona with all its artistic beauty and its spiritual places like the wonderful hermitage of Celle. Also within easy reach other cities and medieval towns like Arezzo, Montepulciano, Siena, Assisi and many more. Near the village, lovers of the movement will cycle paths - walking like the Path of Reclamation which stretches along the bank of the stream They through the Cortona countryside. Stables for horseback riding, sport fishing, ponds cellars where you can taste wines and typical Tuscan products, tennis courts and more. This was a quiet relaxing spot for our last leg of Italy trip. We had covered big cities and were happy to be nestled in the beautiful countryside. Our host Anna Marie and her daughter were very helpful and gave us a warm welcome. the cottage was really nice - comfortable beds, good wi-fi and location was close to Cortona which is a beautiful town about a 10 minute drive from the cottage. Easy drive to some local winerys and 15 minute train to Arezzo if you are looking for more sights. This Tuscany-Italy stay was very relaxing and easy access to tourist points like Cortona, Perugia, Florence, even Pisa. Ana María was a super host welcoming us with some of her handmade snacks, signature wines and olive oil. The olive oil was one of the best olive oils I’ve tasted during my stay. I highly recommend this quaint Tuscan apartment with its surrounding beauty. Thank Ana María for the hospitality. Thanks Norma for everything and for leaving the house tidy and clean. I really enjoyed my stay. The home was probably built in the 1700's and has been updated to modern standards. rlocated in a very small agricultural village and close to a larger city for shoppling, history, restaurants. I is also centrally located in Tuscany so I made overnight trips to Siena and Florence, and day trips to Perugiaa, Arezzo, San Gimignanto and Montepulciano. Anna Marie and Lorella were wonderful hosts and I would recommend their home to anyone who wants a clean, quiet, historic home that is a true Tuscan wxperience. Excellent Base to Explore Tuscany! We recently stayed at this property for 5 nights and had a wonderful time. The hosts Anna Maria and daughter Lorella were very welcoming and happy to go out of their way to make sure we had the best trip possible. Fratticciola is an excellent base to explore the wonders of Tuscany and the apartment served its purpose well in being a very suitable base for us to explore the surrounding area. The apartment we stayed in was very cosy and warm given we stayed over the December period just before Christmas where temperatures were down to close to zero degrees in the evenings. Would love to come back and explore the area during the summer months and make use of the outdoor area available at the apartment. So charming! The perfect, quiet getaway. My stay in Fratticciola was absolutely perfect! Anna Maria and her daughter Lorella were so welcoming from the moment I arrived. They stocked the refrigerator with fresh fruits and tomatoes, a local bread and summer vegetable dish, as well as delicious homemade biscotti and vinsanto! The apartment’s kitchen had everything I needed for the week. The town of Fratticciola is small, rural, and peacefully wonderful! Luckily, my visit coincided with the town’s annual festival celebrating the history of agriculture in the area! I also borrowed the bike for a day trip to Cortona and enjoyed daily runs through the countryside along the nearby gravel bike paths that go for miles through the area. I would highly recommend saying at Casina di Bibo and look forward to my next visit! I didn’t want to leave! I wish I could have stayed a month! From the moment we arrived, Anna Maria and her family welcomed us so warmly. The rental was charming, beautiful, and well appointed. I hope to come back sometime soon. Thanks for everything! I hope to welcome you again! 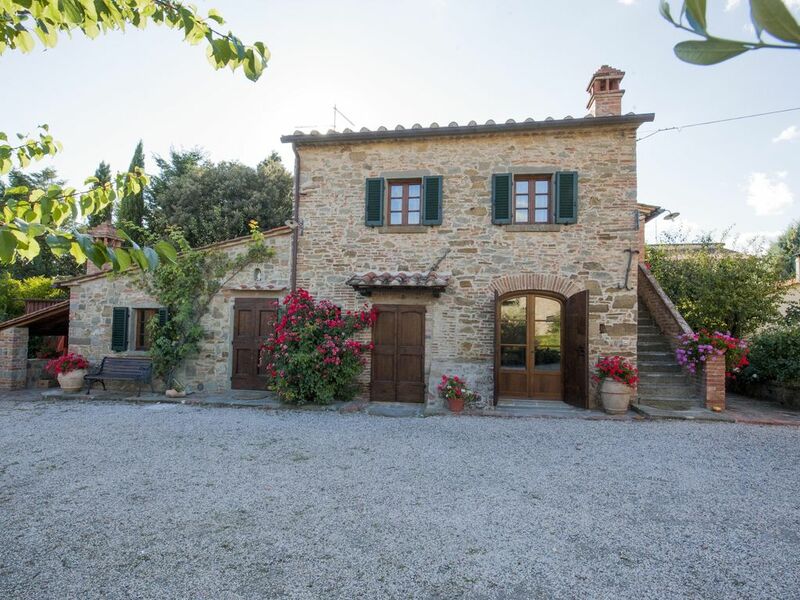 In the quaint farming village of Fratticciola you can enjoy the beauty of the countryside of Cortona, a place rich in history and art, but less suitable for those looking for serenity and relaxation.